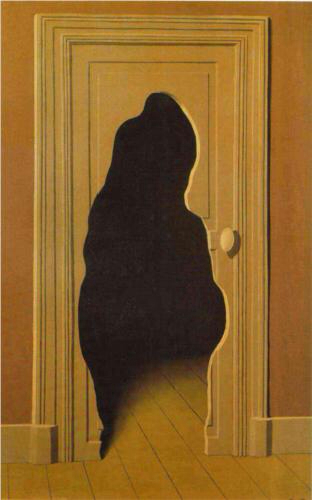 "Unexpected Answer" by Belgian surrealist artist Rene Magritte (1898-1967). Déjà vu, the strong sensation that a current occurrence has already been experienced, has a converse! Jamais vu is the eerie sense of undergoing something for the first time, despite knowing it has happened before. Both phenomena are recognized by the psychological and parapsychological communities, with explanations ranging from psychiatric disorder to reincarnation. But in 2006, cognitive neuropsychologist Chris Moulin of the University of Leeds put the phenomenon of jamais vu to the test. He induced it by means of "semantic satiation." In an experiment in which 92 subjects were asked to write common words including "door" 30 times in 60 seconds, 68% reported sensations of jamais vu. The words began to feel as if they were made up, misspelled, meaningless. Moulin explains that jamais vu can happen to musicians in the middle of playing a familiar passage, to people who visit a place they have been many times, and to those who stare into the face of a friend only to feel that they're looking at a stranger. "If you look at something for long enough the mind gets tired and it loses it's meaning."